Most people use some type of social media app on a daily basis. When you’re on the go you likely see them rapidly pecking away on smart phones or other electronic devices. In fact, you may even be one of them. I must admit that I am. I like to use social media to catch up on news and photos of my friends or simply watch crazy animal videos for fun. However, there are other uses for social media as well. For example, you can help your budget using social media. When you are searching for a particular item to buy it doesn’t always have to be brand new. Sometimes you can help your budget using social media to buy things that are gently used instead. For example, my local community has a sale page where residents can list items they want to sell to others. You can look to see if your city or town has one too. If they do, take advantages of the good deals there to save money on your purchases. You may be able to sell things you are ready to part with or offer your labor to others there as well. You can follow the Facebook pages of your favorite companies by “liking” them. When you do you will see their discount codes, coupons, and sales. 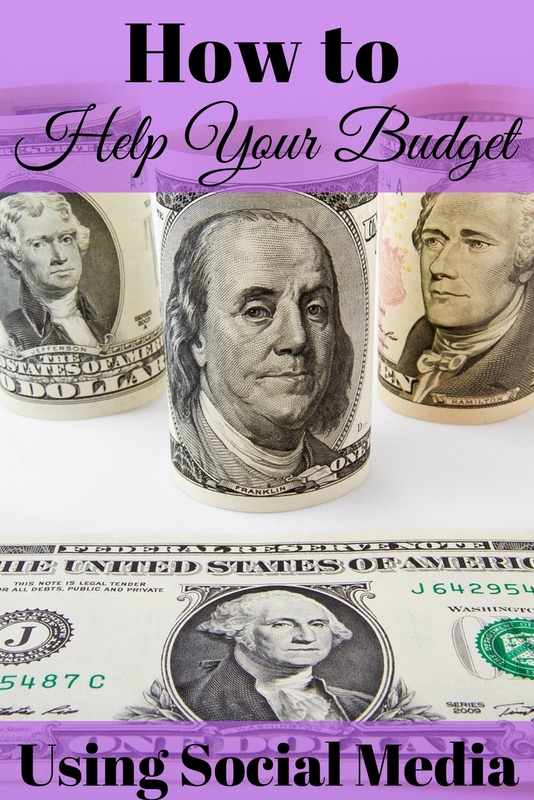 This is a great way to help your budget using social media. Rather than paying full price for things you plan to buy anyway, why not save money? Pinterest is another good way to help your budget using social media. Just access Pinterest settings and turn on the option that will notify you of price drops. That way when items you’ve pinned from retailers go on sale in the future you will know it. Then all you have to do is go to their website and buy the item for less. There are lots of printables you can get free on Pinterest. You can find organization charts, recipes, patterns, and a host of other helpful things as well. Use these printables to save you money and time each month. Hacks on Pinterest can ease the strain of a tight budget. This social media tool has neat ideas that help you DIY nearly anything you can think of. Most of the pins have instructions and pictures to do household tasks, painting, repair jobs, and more. Use these tools to help you do the work yourself and avoid paying for expensive repair jobs. An additional way to help your budget using social media is to ask for reviews from your friends. Of course, you can read product review on company websites or Amazon instead. However, how do you know you can trust the opinions of people you don’t even know? Rather than rely on the word of strangers, use social media to ask your friends. I have done this more than once and saved myself from making a purchasing mistake that would have wasted my money. Once in a while I find that I just can’t figure out how to do a certain thing. For instance, a couple of years ago I needed to know how to cut a mango. I was trying to save money by cooking at home rather than eating restaurant meals. Unfortunately, there wasn’t anybody around for me to ask and I really wanted to use my mango before it went bad. So, YouTube videos rescued me. This is just a tiny example of how to help your budget using social media. Hashtag searches can help you save money in your budget too. Use them to find more savings on Twitter, Facebook, and Pinterest when you are searching for used furniture, coupons, or discounted items to buy. Just type in your search, such as “#coupons”, to help you save money. Social media isn’t just about watching silly videos or reading anecdotes from your friends. Clearly there are lots of ways to help your budget using social media as well. Do you use social media to help your budget?